If your computer is located in the slightly out of position location, which make the action to press the open or eject button to open the CD or DVD drive disc tray inconvenient, then you can create a shortcut to fast access the eject CD and DVD drive function. Shouldn’t it be nicer if user can also simply press a keyboard shortcut or keyboard accelerator key, or hotkey, to instantly eject the CD/DVD optical drive? Taking advantage of a Windows feature, which allows a keyboard shortcut or accelerator hot key to be assigned to shortcut, the shortcut created to eject CD/DVD-ROM or CD/DVD burner can be assigned with a hotkey. With a keyboard hotkey, user can activate the shortcut to eject open the optical drive simply by pressing the keyboard, without the need to double click on the shortcut or icon. 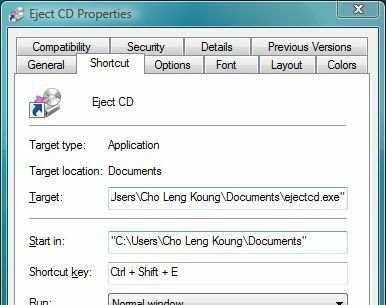 To assign and add a shortcut key to eject and open CD or DVD drive, firstly create a shortcut to eject CD or DVD drive according to this guide. Note that keyboard shortcut or hotkey can only be assigned to shortcut, and not on the executable (with .exe extension) itself. Once the “Eject CD” or “Eject DVD” shortcut has been created, right click on the icon and the select Properties. Go to Shortcut tab if you’re not already on the tab, and then click once on the text field of Shortcut Key. Press a keyboard sequence or hot key that you want to use to eject CD/DVD drive. The field will automatically reflect the keys that you press. When done, click “OK” button to apply the change. The trick works on Windows XP, Windows Vista, Windows 2003, and Windows 2008, and other Windows versions too. In Windows Vista and XP, it’s possible to place the Eject CD/DVD shortcut in Quick Launch bar, and use Quick Launch bar built-in keyboard shortcut as an alternative to open or eject the optical drive.